Thinking of becoming an Ontario Real Estate Agent? Here are three reasons you should go for it. Living Realty sales representatives Eddie and Sharon chatting at the Woodbine office. 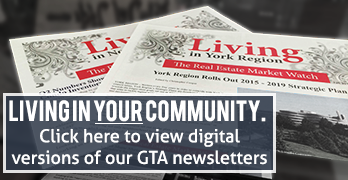 GTA REAL ESTATE – If you’ve been thinking about getting your Ontario real estate license, you’re definitely not alone. In fact, with more than 45,000 real estate sales representatives currently represented by the Toronto Real Estate Board, and an impressive array of new residential and commercial developments constantly on the go, Greater Toronto’s real estate industry is growing every single day. As someone who’s thinking about becoming a real estate sales representative – but hasn’t made the plunge just yet – you’re most likely thinking about what you might get out of it. Is this a career path that can help you build on your professional skill set, for example? What about work-life balance or in-house support? 1. Real estate professionals set their own schedules and enjoy flexible hours. Here’s an interesting fact that not a lot of people know before they enter the industry: when you obtain your Ontario real estate license and join a brokerage team, you’re still your own boss. Agents and brokers enjoy the kind of flexibility and freedom that 9-to-5 jobs rarely offer, which is a big part of the appeal for many professionals. Another one of the job’s most enticing aspects is that agents aren’t chained to a desk. You’ll do your fair share of paperwork as a real estate sales representative, but you also get to mix in open houses, showings, educational courses, and industry events. It’s a great job for those who would like social interaction and a little bit of adventure in their every-day routine. 2. There’s no limit to the success that results from your efforts. One of the greatest things about a career in real estate is that agents’ willingness to work hard is almost always reflected and rewarded. These rewards can come in many forms, whether it’s a dependable source of financial income from commissions, or a stronger network of clients, friends and industry peers. When you are working with a real estate brokerage, no one is going to force you to work late into the night on conducting research or negotiating a complex deal. It’s a perfect fit, though, if you’re the kind of driven and ambitious individual who is naturally inclined to go the extra mile. 3. A great brokerage can provide support, guidance and an opportunity to grow your network. Brokerages are the keystone of the Toronto real estate ecosystem, providing agents with many valuable services. For example, Living Realty Inc. provides our agents and brokers with desk space, special advertising rates, continuing education programs, and multimedia services such as portrait photography and video interview features. There are countless other forms of administrative support that a brokerage provides, but the biggest benefits go beyond services. When you join the team at a leading GTA brokerage, you’ll benefit from one-on-one attention and support from experienced brokers, branch managers, and other colleagues who are happy to share what they know. Of course, these three reasons are just the tip of the iceberg. Many who decide to embark on a real estate career are also passionate about homes – whether they’re interior design buffs, home renovators/contractors or just a ‘people person’ looking to help others find their perfect home. Regardless of what it was that sparked your interest in real estate, the best way to get more information on this dynamic career path is to talk with someone who knows the ropes. If you would like to get in touch with an experienced agent or broker to find out more, don’t hesitate to contact our Branch Managers at Living Realty any time – we’d be happy to schedule personal one-on-one time to help you learn more about our industry. I read the article about Thinking of becoming an Ontario Real Estate Agent?this is really interesting article. Thanks for sharing it with us.